Lyndsay Raymond has earned a master of science in higher education and student affairs administration, attaining a 4.0 GPA while serving in the demanding role of resident director at the college. 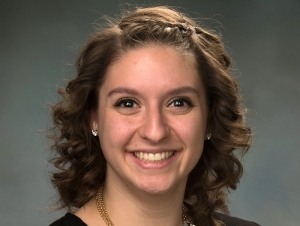 She will receive the President’s Medal for Outstanding Graduate Student and deliver the student address during the 5:00 p.m. master’s hooding and C.A.S. ceremony at Buffalo State’s 146th Commencement, Saturday, May 19, in the Sports Arena. Raymond is noted for her positive demeanor, warm and engaging personality, and ability to connect with and motivate students. With maturity and patience, she is able take control of intense situations and identify solutions that prioritize the well-being of students. She supports students in all aspects of their collegiate experience, not just those that happen within her building. She created, implemented, and facilitated Buffalo State’s Junior Resident Assistant (JRA) program to help train and build leadership skills among student staff members by addressing issues such as conflict resolution, time management, diversity, and networking. The program, which is now an official part of the Residence Life recruitment process, began in 2015 with 20 participants and has grown to more than 80 participants over the past three years. While at Buffalo State, Raymond has served in numerous capacities, including procedural administrator for the Residence Hall Judicial Board, Orientation leader, facilitator of the New Student and Family Programs’ inaugural Camp 1871 experience, co-chair of the NASPA Undergraduate Fellows Program, mentor for the COMPASS Program, and a member of multiple campus committees that address student life and student activity issues. Even on her downtime, she is often found attending college athletic and club events. In addition, Raymond is a model community member. She has worked as a program facilitator for the National Federation for Just Communities, hosting leadership and diversity workshops for high school and middle school students. She is truly committed to creating a positive community by applying her academic knowledge in daily life.